Since being released in Japan during December 2007 and in the UK in the March of 2009, the Nissan GTR has become a performance icon. It’s a practical four seat saloon car that with a claimed time of 7:26 can lap the Nürburgring circuit faster than a Porsche Carrera GT, Ferrari 458 Italia or Lamborghini Murciélago LP670-4 SV. Its profile was raised still further when it was featured on TopGear in a spectacular race where Jeremy driving the GTR raced across Japan against James and Richard on the Bullet train. 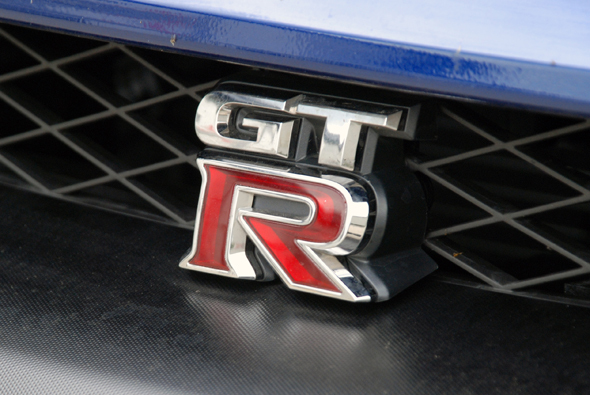 The GTR has often been described as “the car of the PlayStation generation”, and this is certainly pertinent, as many gamers discovered the GTRs predecessor, the Nissan Skyline GTR as part of the Gran Turismo series of games. Appropriately the team from Polyphony Digital who created Gran Turismo helped to design the GTR’s multifunction display, which can be configured to provide the driver with information on engine temperatures, oil pressure, cornering g-force, lap times etc. When this, the face lifted and even more powerful 2011 model was delivered, the first thing that struck me was how large, and in particular how wide the GTR is. Photographs do not give an accurate impression of the sheer scale of this car, it’s certainly not lacking in road presence. Other than an increase in horsepower from 480 bhp to 530 bhp from the 3.8L twin-turbo V6 engine, the other 2011 enhancements include lighter wheels, day time running lights at the front, a redesigned rear diffuser and the option of dark blue paint. 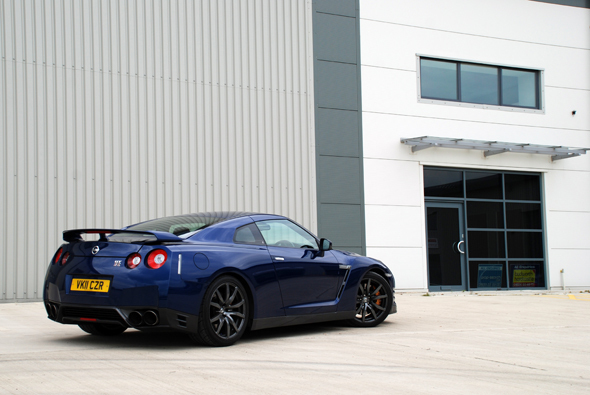 Unfortunately, the GTR is no longer the performance bargain it was when first released in 2009, as these enhancements also come with a price rise of almost £10K, making the list price for a new 2011 model GTR £69,950. 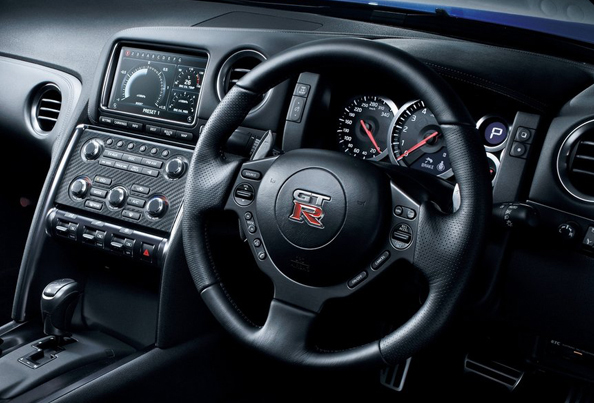 Inside, the GTR has an interior that is almost a match for its rivals from Audi, BMW and Mercedes. Unlike many previous Japanese performance cars, a low quality interior is no longer a valid reason for choosing one of its German competitors. The seats are comfortable and supportive, and the dash is clearly laid out with a large centrally positioned rev counter. I was rather surprised to see that the speedo went all the way to 220. Initially I thought that this was kmph, but no it was actually mph. Therefore, when doing 70 mph on the motorway the needle is only one third of the way around the dial. General visibility is good, with the exception of a huge blind spot over the driver’s right-hand shoulder. The sharply sloping roofline and small rear window ensure that the driver will need to be extra careful when joining the motorway or changing lanes. However, with 530 bhp on tap and a 0-60 time of 3.4 seconds, the driver is going to spend most of his or her time with their eyes fixed on the road ahead. Like most current high performance cars the GTR comes with a paddle shift gearbox, and unfortunately a manual option is not available. At slow speeds the gearbox is clunky and there is significant transmission shut as it changes between gears. If left in automatic mode the GTR is very refined and has already up shifted to 6th gear by around 50 mph, in a futile effort to deliver some level of economy. A swift stab of the accelerator will see the GTR drop a couple of gears in an instant and launch itself towards the horizon. But for real driving thrills the sequential paddle shift is the only way to go. This gives the driver much greater control of the car’s performance, and although still not as much as a proper manual gearbox, it enables you to bring the car alive, extracting much more of the colossal performance that you know is under the bonnet. Once on the move the car appears to shrink around you, but there is no getting away from the fact that this is a large car, particularly on narrow A and B roads, where you are always very aware of the width of the GTR. With 15″ (380 mm) disc combined with Brembo 6-piston front and 4-piston rear callipers, the brakes are as you would expect phenomenal for a road car. 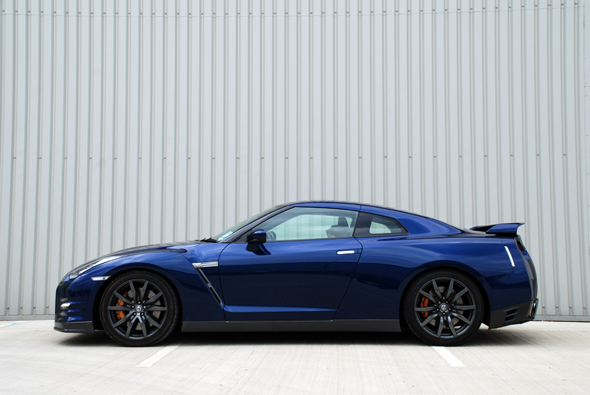 And this is just as well because at over 1,700 kg the GTR is no feather weight like a Lotus Elise. Like the width, you are always conscious of the GTR’s weight, especially when braking from high speed or making quick direction changes. The engine sounds very technical, and you can hear the twin turbo chargers sucking air into the engine when accelerating hard. 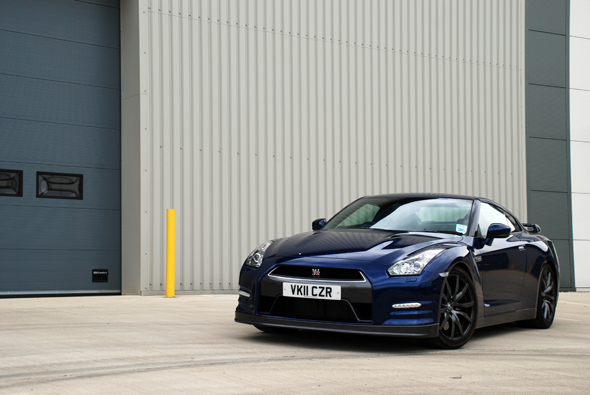 However, the GTR sounds quiet and refined from the inside, without any roar to back up the huge performance. I suspect that this is largely down to bureaucratic noise regulations, but for me this as one of the big disappointments with the GTR, especially when you see the two pairs of huge exhausts that leaves following drivers in no doubt that this is a serious performance car. However, I’m sure that a trip to a performance exhaust specialist like Milltek Sport would easily (if not cheaply) rectify this issue, but it really should sound better when it comes from the factory. The GTR is an awesome car, the performance is breathtaking, the grip and handling are brilliant, and of all the cars I have driven, none has generated as much interest and attention. At huge speeds on the German autobahn this car would be unbeatable, but in the UK on normal roads, the experience lacks any real driver involvement at legal speeds. This is where the PlayStation references comes back to bite the GTR. It is almost too good for the public roads, and this makes the driving experience rather unsatisfying, especially combined with the unwieldy width and hefty weight. So would I buy a Nissan GTR? Well the answer is, it depends. If you are looking for a saloon car with four seats that you can drive every day and would normally have considered an Audi RS4/RS6 or BMW M3/M5, then I would go for the GTR, no question about it. But if I was looking for a second car in which to tap into my inner racing driver for a Sunday morning blast or an occasional trackday, then I think I would look elsewhere for a lighter, more compact and more involving car. Something like the Porsche 911 GT3 RS that I am due to test drive in the next couple of months perhaps.